Information on this on-going project and incremental funding is accessible below and is sequenced from most recent activity nearest the top of the page to inception of the project at the bottom. March, 2019 - As we enter near the end of the regular ice season, we are preparing to address components of this project, including recommendations made by the Mills Group team that need to be performed in the off-season. One of those recommendations, made by Allegheny Design Services, is to conduct ultrasonic NDT testing of our glulam arches. We need to do this in order to accurately predict how renovations can be most appropriately managed within the existing structure. We will also be addressing issues with our sanitary lines in the main restrooms. We have already collected exploratory data on these issues, which have been exacerbated over a period of time by additions to the original plumbing, original pipelines that are outdated and some misuse resulting in the need to regularly cut through non-waste material in the lines. This process weakens the overall line and does damage the line being evacuated to some extent. The repairs we will be addressing will be done with consideration to the larger upgrades to be made in the future. September, 2018 - Concept A was chosen as the designated design by the BOPARC Board. There are opportunities for additional funding that will need to be pursued for the entirety of this concept. 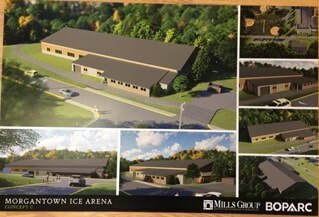 The guaranteed funding available will allow for several needed mechanical and infrastructure updates to the facility itself and will operate within the spirit of the Parks and Trails Levy, which indicated funding for renovations, upgrades and improvements to our Ice Arena. August, 2018 - The Mills Group and its team of engineers, consultants and management specialists, including Allegheny Design Services, Cheat Road Engineering, Firland Management and H.F. Lenz. Mills Group presented designs to BOPARC at the regular BOPARC meeting for that month. These design options and project costs for these options are summarized below. In December of 2017, after a public RFQ advertisement and interview process, The Mills Group was chosen to establish a scope of work and prepare for the design and administration of the project. The RFQ leading to this partnership is accessible below. The Mills Group team conducted research, meetings with BOPARC administration, City administration, site visits, and charrettes with stakeholder groups over several months. Concept A includes utilization of the existing ice sheet and places a studio rink in an expanded space facing the current parking lot. Additional seating, locker room space, a shared Zamboni area, expanded party room space and increase in services offered are some of the highlights. This concept has a cost range of $10Million-$12Million Dollars. Concept B also allows for a full ice sheet plus a studio rink, positioning the studio sheet in a manner that utilizes half of the current sheet. The full sheet would then be comprised of the remaining half of the current sheet and an additional area. This would change the configuration of the facility as shown. 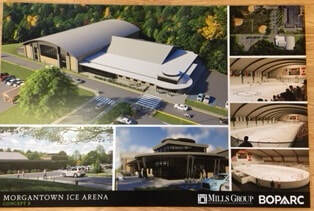 Again, additional seating, locker room space, a shared Zamboni area, and expanded party room space would be planned. This concept has a cost range of $12Million-$14Million Dollars. Concept C makes provisions for necessary systems upgrades, including upgrades and necessary modifications to HVAC (upgrading the vaper barrier and dehumidification units), installing new fire alarm and electrical distribution systems, LED lighting, and addressing long-term chiller issues, among other necessary systems work. These upgrades are included in Concepts A and B as well, as they are the first steps in bringing the facility into a more 21st Century model. This concept represents $2.5Million Dollars in upgrades. 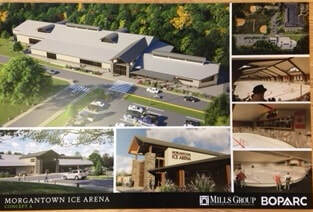 In a Special Meeting on February 10, 2016, the Board of Park and Recreation Commissioners voted to participate in an excess levy call for the purposes of the following project: To receive funds for improvements, upgrades and renovations to the Morgantown Ice Arena. This was one of a host of projects on the ballot in relation to parks, recreation & trails in the community managed by several different entities. BOPARC would like to thank each and every patron and citizen that made the levy successful! Without your support our community trails would have suffered a major funding shortfall and we would not someday be able to put forth the dream of upgrades to our local Ice Arena. This project has been planned as a long-term solution for needed upgrades and improvements to our current facility. These upgrades will require design and engineering studies and renovations will not be undertaken until the proper planning is put forward on the front end. Now that an avenue for funding is secured, BOPARC will begin the planning process with appropriate partners and sources of support and will move forward with the on-site improvements after all funding has been received and all required planning steps have been completed. Remember, this funding is spread over five (5) years and will be received in quarterly payments. The amounts of those payments will vary based on the receipt of actual property tax dollars. Funds will be placed in a separate account in order to comply with our audit requirements. Project 2 – New warming room, party rooms, pro shop and skate rental room area. Updated refrigeration system, LED lighting and ceiling to prevent humidity build-up. New bleachers and flooring surrounding the ice floor as well as new boards, glass and nets. An all new gas fireplace–stone covered and running the height of the building. Remolding of locker rooms will be remodeled. 7 Million Dollars. Please continue to follow our Levy Updates at www.boparc.org and if you would like to complete a survey regarding the needs of the Ice Arena community, it can be downloaded and returned to info@boparc.org as well.